The lights had been dimmed and I was trying to nap like many of my fellow passengers were doing, but I just couldn’t seem to get comfortable. I’m a relatively short person, and I’ve always thought this to be an advantage when flying. I can stretch out my legs with ease, or curl them up under me in my seat if I want. I should have been more comfortable than the other passengers around me, but I wasn’t. It hit me, as I wriggled around in my seat, that my neck was killing me. Not only was my headrest too high to actually rest my head on, but it was actually pushing my head down in an unnatural way. 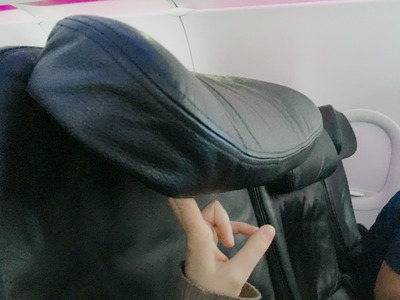 The largest part of the headrest wasn’t protruding at the nape of my neck, but rather, right at the back of my head. Portia Crowe/Business InsiderThis headrest flips up. What could possibly be the purpose of this feature? I began to examine the headrest to see whether I could readjust it (it turns out I could slide it higher, but not lower), and in the process, it occurred to me that this wasn’t a new problem. In fact, I experience this on just about every flight I take. But it took a five-and-a-half hour journey in the middle of the day for me to put my finger on it. I should note that I’m not even that short for a woman. And a cursory look around me showed that I wasn’t the only short person dealing with this problem. The woman across the aisle from me had opted to slouch down so far her head was resting below the headrest, against the middle of the seat back. And, for some inexplicable reason, the headrests on this particular aircraft actually lifted up on a hinge like the lid of a garbage can. Surely that’s an unnecessary feature? I can’t recall experiencing this problem on trains or in any other sort of chair. And the solution seems relatively simple. In the meantime, I’ll considering bringing a phone book along on flights.